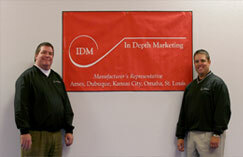 We'd like to welcome you to In Depth Marketing's website. We are commited to providing the best service for both the manufacturer and our customers. Copyright 2007 In Depth Marketing. Site Design & Hosting by OpenCom.